Does the Razer Phone 2 support Wi-Fi calling? Wi-Fi Calling is known to work with T-Mobile and may work with other GSM networks. What are the new functionalities coming with Android 9.0 Pie for the Razer Phone 2? Can I download the Android 9.0 Pie on my Razer Phone 2 via OTA? Android 9.0 Pie will be available for download via OTA. Note that for those who purchased devices through a carrier, an OTA update will be available in accordance with those carrier’s specific build. When will the official release of Android 9.0 Pie be available for download on the Razer Phone 2? The official release of Android 9.0 Pie for Razer Phone 2 will be available in Q1 2019. Note that for those who purchased devices through a carrier, an OTA will be available in accordance with those carrier’s specific build. I updated my Razer Phone 2 to Android 9.0 Pie – I don’t like it. Can I downgrade back to Oreo 8.1? Yes. Download and follow the steps in https://developer.razer.com/razer-phone-dev-tools/factory-images to reload your device with the factory images. WARNING: Manually flashing system images (including reverting back to Oreo) requires a full device reset and removes all user data on the device. I bought my Razer Phone 2 from 3 retail store, can I still try out Android 9.0 Pie? Yes, but for those who have purchased devices through a carrier, an OTA update will be available in accordance with those carrier’s specific build. I encountered software bugs on my phone with Android 9.0 Pie. Where can I get help? If the bug is related to the application, please check if there is a newer version of the Application that is compatible with Android P. If it’s bug with the Android Pie OS, please provide your feedback to our Customer Support. How can I obtain carrier apps to install on my Android 9.0 Pie? Some carrier apps may be able to be obtained from the Play Store, others may not be available. What security update comes with this build? When will the Razer Phone 1 receive Android 9.0 Pie? The Razer Phone 1 is currently under evaluation for Android 9.0 Pie. What are the specs of the Razer Phone 2? How do I adjust the refresh rate to 120hz on my Razer Phone 2? To unlock all the stunning benefits of the Razer Phone 2's 120 Hz UltraMotion™ screen, be sure your refresh rate is set to 120hz. To adjust your refresh rate, go to the Phone's "Settings", navigate down to "Display", select "Refresh Rate" and choose the "120Hz" option. Please note, some older games may have issues playing on the 120hz settings. For games such as Jetpack and Sonic 2, you can select the games within Razer Game Booster and set the default rate to 60Hz for those specific games. Once that is selected within Game Booster those games will automatically default to 60Hz without affecting the refresh rate on other applications. Higher refresh rates may also have some minor effects on battery life. What games are optimized for the 120hz refresh rate of the Razer Phone 2? Based upon tests performed internally at Razer, the titles listed below support UltraMotion but do not necessarily reach 120 FPS. Some titles are still under development, thus feature sets are subject to change. The list is as of September 2018, however, new titles are being added all the time and other titles may be supported. Where can I find Gamebooster on Razer Phone 2? Game Booster is now integrated with Cortex. Open Cortex and you will find Gamebooster from the menu. Where can I find more information about Razer Mobile apps like Razer Cortex Mobile and Razer Pay? Please see frequently asked questions and their answers here. Does the Razer Phone 2 support Traditional and Simplified Mandarin Chinese character inputs? Yes, this is supported on the Razer Phone 2, just download the desired input application from the Google Play Store. Go to Settings > System >Languages and input and tap "Virtual Keyboard". Enable the keyboards you installed. You may be prompted to enable permissions. To switch keyboards when entering text, click the keyboard icon in the very bottom right of the screen. What type and size of camera does the Razer Phone 2 have? The Razer Phone 2 has a powerful, dual-camera system that consists of both a 12MP wide-angle and 12MP telephoto module for excellent photos wherever you go. How can I get the Razer logo on the Razer Phone 2 to light up with app notifications? Please be sure that you have installed the Razer Chroma Configurator app. If you have notifications turned on in the Chroma app, the Razer logo on the back of the phone will light up once you receive a notification. To check if Notifications are turned on, tap to expand the Razer Phone 2 settings in your Chroma app. Can I configure the color of the notification light on the Razer Phone 2 for each individual app that sends a notification? The Razer Chroma App does not natively support changing the color of the notification light based on the individual application. By default, the notification light will default to the system or app default color. Why is the Razer logo on my Razer Phone 2 not lighting up even if I have the app notifications turned on and enabled in the Chroma app? If your phone's battery is below 10%, the app notification will automatically be disabled until you start charging your phone or the battery reaches above 10%. How do I clear the app notification light from the logo on my Razer Phone 2? To clear app notification lights from your Razer logo, unlock your phone and view your notifications. If you want to remove all notification lights, go into your Chroma app and disable notifications. Can I configure the color of the notification light for each app? We do not natively support changing the notification light colors per app within the Chroma app. By default, the notification light will default to the system or app default color. Can I use Razer Phone 2 on Verizon's network? To all Razer Phone 2 owners on Verizon, thank you for your patience! The #RazerPhone2 can now be activated on Verizon 4G LTE Network. Please follow the steps below to activate your new Razer Phone 2. Log in to your MyVerizon account on the Verizon website. Hover over the “My Devices” link at the top of the page. Choose “Activate or Switch Device” from the available menu. Select “Activate a device on an existing line”. Follow the on-screen activation steps. Select “I’m not with Verizon”. Follow the on-screen instructions to create your account and activate your Razer Phone 2. Can I use Razer Phone 2 on Sprints network? The Razer Phone 2 will work with GSM networks, like AT&T, and T-Mobile. It will also work with Verizon’s 4G LTE Network. CDMA networks like Sprint and Verizon CDMA are not supported. What other mobile networks will the Razer Phone 2 work with? Does the Razer Phone 2 have a headphone jack? The Razer Phone 2 includes a headphone adapter in the box that utilizes its own 24-bit DAC for the best experience when using your old headphones. You can also plug any USB C headphones right into the phone (like the Razer Hammerhead USB-C headset). What is the battery life of the Razer Phone 2? The Razer Phone 2 is forged with a huge 4,000mAh battery that will last you all day. How much storage does the Razer Phone 2 have? The Razer Phone 2 has an internal storage of 64GB UFS that can be expanded up to 1TB using the microSD (class 10) slot. Does the Razer Phone 2 support Bluetooth®? Yes! The Razer Phone 2 does support Bluetooth® 5.0. Does the Razer Phone 2 support Miracast and other wireless display/screen mirroring options? The Razer Phone 2 supports Miracast and Chromecast and allow you to share/mirror the content on your Razer Phone 2 with your TV. Please visit the following URLs to learn more about these technologies, its requirements and how to set it up. How do I restore the Razer Phone 2 back to the stock, original, out-of-box OS or image? There are two (2) ways to get back to stock. If you haven't installed custom, 3rd-party software onto the device, you can simply factory reset the device by going into the Settings menu, selecting Back Up and Reset, then following the instructions to Factory Reset the device. If you have installed custom software onto Razer Phone 2, then the process will involve more steps that will require flashing firmware that will be available. It is suggested that you do NOT flash to custom software as this would void your warranty. How is the Razer Phone 2 different from an iPhone or Android phone? The Razer Phone 2 is an Android device running version Oreo 8.1. However, our team of engineers has taken the experience to the next level by including hardware and software features you've never experienced like our 120Hz display featuring UltraMotion™ technology. What version of Android is coming with the device? The Razer Phone 2 will launch with Android Oreo 8.1. How do I back up the data on the Razer Phone 2? With the Razer Phone 2 having an Android OS, it's easy to back up your data. If you're concerned about the photos you've taken, back them up with Google Photos which will save all your photos in the cloud. Your contacts and apps will be stored in Google's cloud. Any other files will require you to connect to the Razer Phone 2 to your computer and transferring files over to a safe location. Can I still recover my data when the Razer Phone 2 is lost or dead? In the unfortunate event that this happens, you may not be able to recover everything on your Razer Phone 2. If you've backed up your data on your Google account, you may be able to find your contacts, photos, and videos online. What is the difference between the Android Operating System and the OS on the Razer Phone 2? The Razer Phone 2 was made as close to stock Android as possible. Our engineers have added some neat features like a license to Nova Launcher, the best Android launcher on the market, and added some performance enhancements so that you can play your favorite games longer. If I enable Root Access on the Razer Phone 2, will it void the warranty? Modifying your Razer Phone 2 by unlocking the bootloader or rooting your device will void your warranty. What is the warranty on the Razer Phone 2? The Razer Phone 2 will have a one (1)-year Warranty. Please visit the Razer Warranty Policy page for more details about Razer Warranty. How can I extend the battery life on the Razer Phone 2? Here are some tips that may help you extend the battery life of your Razer Phone. Turn Razer Cortex > Game Booster to "Power Save"
Is it possible to upgrade the storage of the Razer Phone 2? Yes, you can extend the storage up to 1TB using the microSD (class 10) slot. What are the expansion slots available for the Razer Phone 2? The Razer Phone 2 features an expandable storage slot that supports SD cards of up to 1TB in size. Is it possible to customize the theme of the Razer Phone 2? Yes, you can customize the theme of the Razer Phone 2 by opening the "Theme Store app," downloading a theme you like, and applying that theme to the phone. What is the screen of the Razer Phone 2 made of? is it scratch-proof or shock-proof? The screen is made of durable Corning Gorilla Glass 5. Though it is strong and scratch resistant, but not shockproof. If you're worried about cracking it, we suggest you purchase a tempered glass screen protector. What colors is the Razer Phone 2 available in? The Razer Phone 2 is only available in black. Does the Razer Phone 2 have Biometrics security feature? The Razer Phone 2 features a fingerprint sensor built into the power button. It's very safe and secure. Does the Razer Phone 2 have facial recognition feature? No, the Razer Phone 2 does not feature facial recognition. Does the Razer Phone 2 have multi-touch functionality? The Razer Phone 2 does support multi-touch functionality. Does the Razer Phone 2 have USB mini ports or USB type - C for charging? The Razer Phone 2 supports USB Type-C for charging. Plug it into our Charging brick to get topped off quickly. Where are the wireless charging coils on the Razer Phone 2? The coils are located near the bottom center of the phone. 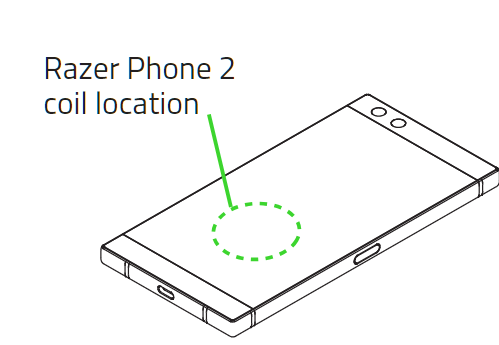 Please refer to the diagram below for the location of the charging coils on the Razer Phone 2. If attempting to use the phone on any Qi-enabled charger, please be sure to align the coils of the phone to the coils on the charger. Will the charging performance be affected if I have a phone case on the Razer Phone 2 when wireless charging? Yes. Phone cases increase the optimal distance between your Razer Phone 2 and the wireless charger. This may impact charging ability and charging speed. Do not use phone cases with metal surrounding the phone. During the wireless charging, the back of the Razer Phone 2 cannot have any attached iron, metal, coins, IC cards, bank cards, magnetic absorbers or other metal objects. Are there any memory or color options for the Razer Phone 2? The Razer Phone 2 only comes in the black color and with 64GB of internal storage and 8GB of RAM. How thin is the Razer Phone 2? The Razer Phone 2 is 8.5mm thin and feels great in your hands. Is there a built-in "intelligent assistant" for the Razer Phone 2? Yes! The Razer Phone 2 supports Google Assistant that can help you with nearly any task. Is the Razer Phone 2 capable of virtual reality? The Razer Phone 2 does not support certain types of VR like Daydream but can support Google Cardboard. Does the Razer Phone 2 have gesture customization? By default, the Razer Phone 2 uses Nova Launcher that supports full gesture customization. What is the expected battery life of the Razer Phone 2? With a huge 4,000mAh battery, the Razer Phone 2 will last you all day. Is the Razer Phone 2 unlocked? There are both unlocked and locked versions of the Razer Phone 2, depending on your place of purchase. Please check with your retailer for more details. How do I transfer the data/files from my previous phone to the Razer Phone 2? If you're coming from another Android device, it is quite easy to transfer your data over to you Razer Phone 2. Follow the instructions when you first boot up your Razer Phone 2, and it will tell you how to move from your old phone to set up your new one. Can I transfer data/files from the iPhone to the Razer Phone 2? Yes, you can. Click here to learn how. Where can I find the serial number of the Razer Phone 2? You can find the Serial Number of your Razer Phone 2 by going into Settings > About Phone > Status. What is the sound system used in the Razer Phone 2? The Razer Phone 2 features dual front-firing stereo speakers enhanced by Dolby Atmos for an immersive audio experience. What is an IMEI number and how do I find it? IMEI or International Mobile Equipment Identity number is a unique number to identify 3GPP and iDEN mobile phones. You can find the IMEI number of the Razer Phone 2 in the following locations. On a sticker underneath the box, your phone came in. By entering "*#06#" on you Razer Phone 2's dial pad. By removing the SIM tray and viewing the IMEI number on the bottom of the SIM Tray. Can I use the accessories from the original Razer Phone with Razer Phone 2? We suggest you use the accessories that come with the Razer Phone 2. 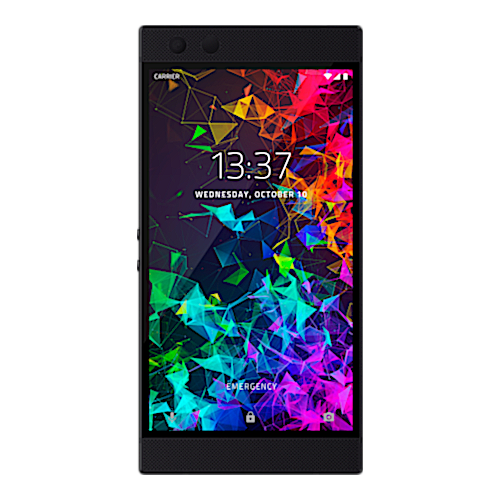 We have tested accessories from the Razer Phone with the Razer Phone 2 and the basic functions worked fine, however, we cannot guarantee complete compatibility or optimal performance. Also, please note the case for the original Razer Phone is not compatible with the Razer Phone 2. What type of accessories comes with Razer Phone 2? What is the Vapor Chamber Cooling System in Razer Phone 2? Razer Phone 2's cooling system utilizes a custom vapor chamber system. This provides more surface area for heat to dissipate. Does Razer Phone 2 support Dual SIM? No, Razer Phone 2 does not support Dual SIM or eSIM. Is the Razer Phone 2 waterproof? The Razer Phone 2 is tested with IP67 water and dust ingress resistance, meaning that it is protected from submersion in fresh water up to 1m deep for up to 30 minutes. The power adapter and accessories are not water resistant. Splash, water, and dust resistance are not permanent conditions and resistance may decrease as a result of normal wear. Do not attempt to plug in accessories or charge cables to the Razer Phone 2 USB Type-C receptacle if exposed to wet conditions. Should your phone get wet, dry it thoroughly with a soft, dry cloth. Ensure your phone and USB-C port is fully dry before attempting to charge your phone again and/or remove your SIM card tray. Please note that damages caused by sand and/or liquid will not be covered by the warranty. The Razer Phone 2 has a retail MSRP of $799.99 USD. Does the Razer Phone 2 Logo light up and feature Chroma effects? Yes, the Razer Logo lights up and you can change the color of the logo using the Chroma App. The Razer Phone 2 comes pre-installed with the Chroma App and features the Razer Chroma lighting effects of Breathing, Spectrum Cycling and Static. How does the Razer Phone 2 compare with the Razer Phone? The Razer Phone 2 will work on Verizon using their 4G LTE networks. Verizon CDMA network is not supported. Does the wireless charging dock come with the Razer phone 2? The Razer Wireless Charger is sold separately. I want to have more information about the wireless charger. How can I tell if my Razer Phone 2 has liquid damage? Check here on how to tell if the phone has liquid damage. How do I open and repair my Razer Phone 2? All repairs for the Razer Phone 2 must be performed by an authorized Razer repair center. Opening your Razer Phone 2 will jeopardize your warranty and cause damage to the seals that protect your phone from liquid and dust intrusion.